I tried to adapt the pattern I used for my previous pair for this sock. I liked the pink TLC Wiggles yarn, but not the blue (yarn shall remain nameless). 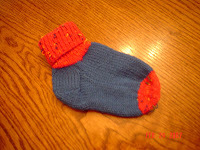 The blue yarn was very rough and I didn't like the "thickness " or bulging part at the instep. I thought perhaps it was because I used a stockinette stitch, but it is probably just my inexperience as a sock knitter and the fact that I was adapting an adult pattern for a child. I'm not finishing the second sock of this pair. My daughter suggested that I wash it and see if the blue part becomes softer. I have found a couple of children's sock patterns that I would like to try in the TLC Wiggles yarn.